Why complicate things when you can easily gather data from plots by overflight and scanning them. CNH has taken up this phenomenon and goes as full service marketing worldwide through the Case IH / STEYR and New Holland dealer network. 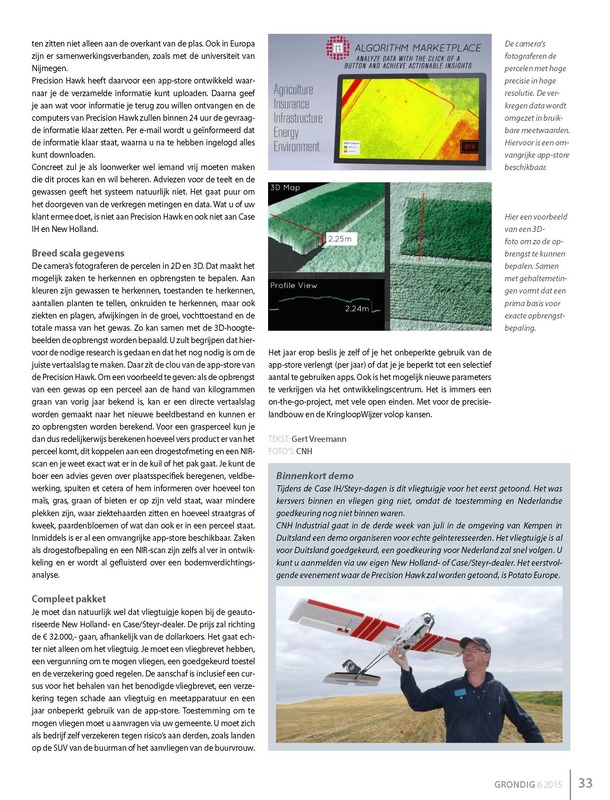 The potency: the complete field and crop analysis from the air with the corresponding practical translationeasy:. Actually it is very Google Maps, select one or more lots and loads it into the unmanned aerial device, officially UAV (Unmanned Aerial Vehicle) called . You do this, you do not subscribe to a separate or RTK GPS network. Activate in the field, plane 'throw the air "and that aircraft harness rises without further guidance on at approximately forty meters. There, circling it once around to scan the weather conditions, especially the wind direction and wind speed. Then it chooses independently its own flight path at a predetermined height to scan the entire field. As a rule Communities turn it exactly with the wind or against the wind to avoid cam- era abnormalities. With around 50 km / h fly the route are completely independent and can scan in one hour at an altitude of 100 meters, approximately 400 hectares and filming. You do not need to send or give up because the plane does so entirely autonomous. It then automatically lands in the same place or at a pre-specified by you spot. The collected data (ie the pictures) load or transmits it on to your home computer. The aircraft is the Precision Hawk, as already known from Canada and America. There CNH has deliberately chosen. Precision Hawk has a UAV designed to carry different cameras, including cameras developed by third parties, provided that they adjust the suspension points and not exceed the maximum payload of one kilogram. Then the real work begins, because you then have about 30 GB of pixels that need to be translated into usable data. Precisely because CNH one to beat. 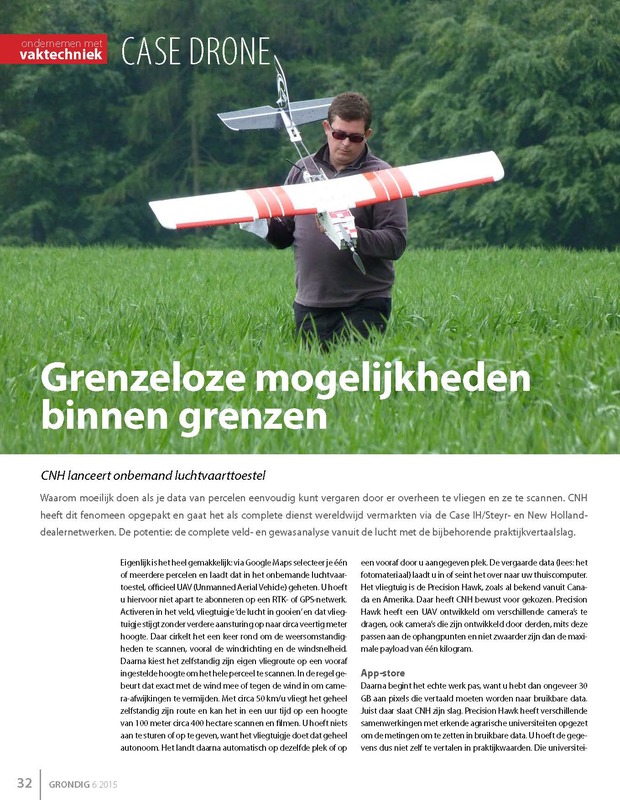 Precision Hawk has several collaborations with recognized agricultural universities set up the measurements into usable data. You only need to translate the data does not itself practice values. Those universities at not just sit across the lake. In Europe there are partnerships such as with the University of Nijmegen. Precision Hawk has developed its app store to which you can upload the information gathered. Then would you give what information you would like to receive and return the computers of Hawk Precision will put the information the gevraag- ready within 24 hours. You will be informed by e-mail that information ready, and you have logged in you can download everything after. Specifically you as a contractor or someone should release which can and intends to manage this process. Recommendations for growing crops and of course, the system is not. It is purely to pass on the acquired measurements and data. What you or your client does with it is not to Precision Hawk nor to Case IH and New Holland. Wide range of data The cameras photograph the plots in 2D and 3D. This makes it possible to recognize things and to determine yields. Of colors can be recognized crops, to recognize states, to count numbers of plants, to recognize weeds, but also pests and diseases, abnormalities in growth, fluid state, and the total mass of the crop. As can be determined together with the 3D images highs yield. You will understand that hereinbefore the necessary research is done and that it is still necessary to make the correct translation. That's the essence of the app store Precision Hawk. To give an example, if the yield of a crop on a plot based on kilograms of grain last year is known, there is a direct translation to be made to the new image file, and so revenue can be calculated. For a grass plot can you so reasonably calculate how much fresh product comes from the plot, this link to a measurement of solids and an NIR scan and you know exactly what goes into the den or pack. Be the peasant give advice on site-specific irrigation, field visits effect, syringes etc. or inform him about how many tons of corn, grass, corn or beets's on his field, where his lesser places where outbreaks are and how many bluegrass or cultivation , dandelions or whatever is contained in a plot. Meanwhile, there is already an extensive app store available. Things like solids determination and an NIR scan are even far in development and there are already whispers about a bodemverdichtings- analysis. You must, of course, buy that plane in the computerized ized New Holland and Case / STEYR dealer. The price will towards the € 32,000, - go, depending on the dollar. However, it goes to not only the aircraft. You must have a license, a permit to fly, an approved device and arrange good insurance. The purchase includes a cur- sus for obtaining the required license, an insurance against damage to aircraft equipment and one year unlimited use of the app store. Permission to fly you must apply through your municipality. You must insure themselves as business itself against risks to third parties, such as countries in the SUV neighbor or approaches by the neighbor.